Snippet Preview Rebuilding your Virtual SAN Lab? Wipe the disks first! Rebuilding your Virtual SAN Lab? Wipe the disks first! 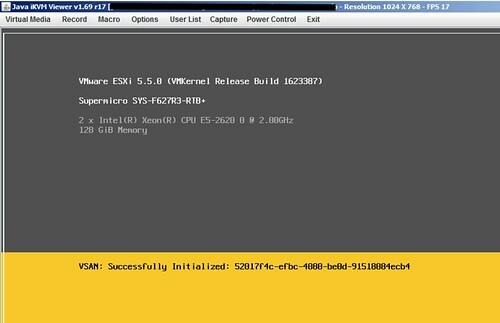 Are you ready to start rebuilding your Virtual SAN lab from beta builds to GA code, vSphere 5.5 U1? One thing I noticed is that the installer is extremely slow when there are Virtual SAN partitions on disk. It sits there at “VSAN: successfully initialized” for a long time and when you get to the “scanning disks” part it takes equally as long. Eventually I succeeded, but it just took a long time. Could be because I am running with an uncertified disk controller of course, either way if you are stuck in the following screen there is a simple solution. Just wipe ALL disks first before doing the installation. I used the Gparted live ISO to wipe all my disks clean, just delete all partitions and select “apply”. Takes a couple of minutes, but saved me at least 30 minutes waiting during the installation. Ran into the same issue – now I’m starting from scratch but when I attempt to add my two disks to my first disk group it seems to just hang on “Initialize disks to be used by VSAN” in Recent Tasks – been running about 20 minutes now. Worked fine in the Beta. Hopefully it will time out eventually and provide me with some worthwhile error. Hey Matt, having the same issue here. “Initialize disks to be used by VSAN” and after approx 1h my ESXi host stopped responding. Did you find out something? Are you using the AHCI disk controller? yes, I am using the onboard AHCI. Pretty sure that is the issue. See my other blog post on that topic. I used gparted to wipe a few Disks and SSDs. But I was not able to re-use the SSDs even if it had no partitions on the devices. I had to go back in gparted and use the Devices menu, and create a Partition Table with the GPT option and apply it. we’ve noticed that disks show low performance after they have been removed from vsan. and it appeared that vsan disables write cache on the hdds, and does not enable it back when you remove them from vsan.